What's in a caramel wine aroma? This part of the wine aroma dictionary let you discover caramel wine aromas that you may perceive in wines. This is still a work in progress and we will add regularly new descriptors extracted from the wine aroma wheel. Feel free to leave a comment or question at the bottom of the page. Aroma definition: Aroma evoking a butterscotch candy. When I moved to the US, I had no idea what this term referred to. After smelling the aroma standard that the flavorist made for me, I was able to relate this smell to caramel made with butter, not just water and sugar. Butterscotch doesn't have any burnt component like Caramel can have. 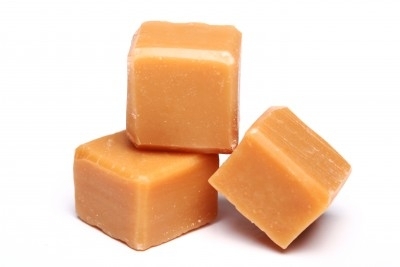 Furfural and 5- methyl furfural are two compounds that can impart a butterscotch aroma. However other compounds may contribute to this note, such as diacetyl (for the buttery character). Origin: this type of aroma develops when a substrate is heated. Winemakers use oak barrels that are toasted as part of the barrel making; the volatile compounds originate from this process and then can migrate to the wine that is stored in them. Depending on the toast level, different aromas can be developed in the barrel from caramel-like to smoky burnt. Aroma standard: In 30 ml of white/ red wine, let macerate a butterscotch candy for few hours in a hermetic container. You can adjust the desired intensity level with maceration time. If you tasted this aroma standard, the wine will also taste sweeter. Try to focus only on the olfactory perception. Learn more on how to make your own wine aroma kit. Enrich your Wine Vocabulary using the Wine Aroma Wheel.